In the past week, United Continental Holdings, Inc. UAL and JetBlue Airways Corporation JBLU issued upbeat third-quarter unit revenue views, courtesy of solid demand for air travel. Meanwhile, Hawaiian Holdings, Inc.’s HA wholly owned subsidiary, Hawaiian Airlines, trimmed its projection for operating revenue per available seat mile (RASM: a key measure of unit revenue) due to adversities arising from Hurricane Lane. This apart, quite a few companies including the likes of Azul S.A. AZUL, Gol Linhas Aereas Inteligentes S.A. GOL and United Continental’s subsidiary — United Airlines — revealed respective traffic data for August. Moreover, carriers including the likes of Southwest Airlines Co. LUV and JetBlue waived fees for ticket changes due to Hurricane Florence. 1. At the Cowen and Company 11th Annual Global Transportation Conference, JetBlue stated that it now anticipates RASM to grow between 1% and 3% for third-quarter 2018 (the earlier view had called for the key metric to grow in the 0-3% range). The company also hit the headlines when it announced the decision to add transcontinental routes. As part of its expansion initiative, the carrier started operating non-stop flights connecting New York’s John F. Kennedy Airport and Southern California’s Ontario International Airport (read more: JetBlue Unveils Improved Q3 Unit Revenue View). 2. United Continental said that it now expects third-quarter consolidated passenger unit revenues at the high end of the guided range of 4-6% increase at the Cowen and Company 11th Annual Global Transportation Conference. On another positive note, the company anticipates its pre-tax margin — excluding special charges and the mark-to-market impact of equity investments — in the high end of the earlier estimate of 8-10% (read more: United Continental Q3 View Upbeat Despite Fuel Cost Headwind). On a separate note, load factor (percentage of seats occupied by passengers) at United Airlines increased 200 basis points to 87.3% in August as traffic growth (7.8%) outpaced capacity expansion (5.4%) (read more: United Continental's Traffic & Load Factor Rise in August). 3. Hurricane Lane, which disrupted operations at Hawaiian Airlines and led to decline in bookings, was the primary reason behind the carrier’s bearish third-quarter RASM view. The metric is now expected in the range of -2% to 0% (on a year-over-year basis). Furthermore, the carrier has slashed its guidance for full-year capacity and gallons of jet fuel consumed (read more: Hawaiian Holdings Bearish on Q3 RASM, Revises 2018 View). Hawaiian Airlines also unveiled a disappointing traffic report for August due to the hurricane. 4. At GOL Linhas, August traffic — measured in revenue passenger kilometers — inched up a mere 0.1% on a year-over-year basis to 2.99 billion. Consolidated capacity (or available seat kilometers/ASKs) expanded 1.7% to 3.89 billion. Load factor fell to 76.9% in the month from 78.2% in the year-ago period (read more: Gol Linhas' Traffic Rises in August, Load Factor Dips). 5. At Azul, consolidated traffic for August increased 21.5% to 2.11 billion mainly owing to a 43.4% rise on the international front. Meanwhile, domestic traffic rose 14.6%. Traffic figures were aided by a strong demand for air travel. Consolidated capacity expanded 20.3% to 2.57 billion (read more: Azul's August Traffic & Load Factor Increase on Higher Demand). 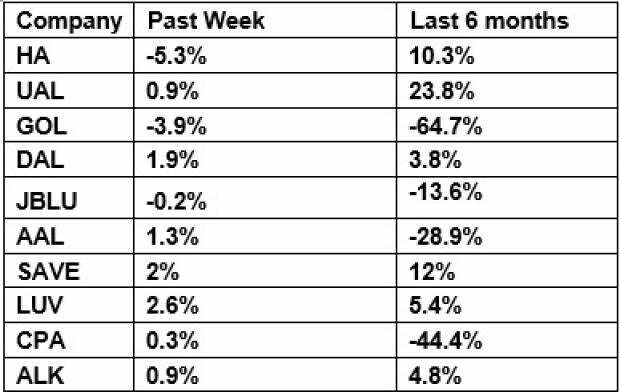 The table above shows that most airline stocks traded in the green over the last week even though gains were muted in nature. Consequently, the NYSE ARCA Airline Index increased marginally over the past week. Over the course of six months, the sector tracker decreased 12.1% mainly due to huge losses at Latin American carriers — Copa Holdings and GOL Linhas. Investors will look forward to further updates on the ongoing labor unrest at European low-cost carrier, Ryanair Holdings plc RYAAY, in the coming days. August traffic reports from the likes of JetBlue are also likely to invite attention in the next few days.